""Hopefully all participants can present the best performance "
Jakarta Governor, Anies Baswedan officially opens Jakarnaval 2018 Festival in front of City Hall today. "Hopefully all participants can present the best performance ," he expressed, Sunday (7/8). Besides witnessed by Jakarta people, the festival is also aired throughout Indonesia. "That's why they (participants) must give the best performance," he told. He explains Jakarnaval that takes theme 'Forward, Fair and Happy' is also held to enliven the forthcoming Asian Games. Even there are some athletes are participated in the festival parade that will start from Jalan Medan Merdeka Selatan until Barat with decorated vehicles. "So let's welcome the Asian Games. In August, all the world's eyes will be on Indonesia. So we have to show that we can be a good host," he stressed. 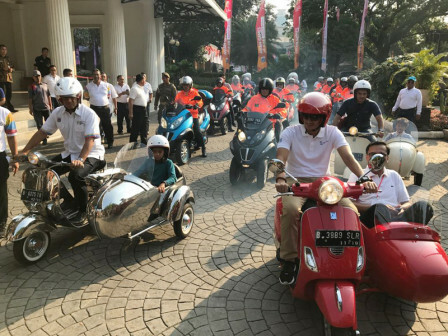 Based on Beritajakarta.id, in the event, he accompanied by his partner, Sandiaga Uno ride a vespa vehicle from City Hall to the stage at Jalan Medan Merdeka Selatan. Together with his son, Ismail Hakim Baswedan, he directly get a warm welcome from residents who have been waiting on the roadside. During the trip to the entertainment stage, both are accompanied by dozens of drivers from the vespa community. They also symbolically released carnival participants with various performances of arts and decorated vehicles. As for the information, Jakarnaval 2018 is held as a series of city's anniversary. After this event, it would be continued with entertainment stage that is held on the west side of Monas area. It is slated to be enlivened by famous artists and musicians, namely Rizky Febian, Budi Doremi, Siti Badriah, Saykoji, Naff.